First of all- congratulations! Whether you graduated a little over a month ago, like me, or three years ago graduating from college is a great accomplishment to be proud of. Now, let’s get real- the last few weeks (and months- if we’re being honest) of undergrad are filled with so many questions. Will I land a job before graduation? Will I land a job three months after graduation? Should I go straight into a Master’s program? Do I Have any idea what I’m doing with my life?! There are just SO many questions for those of us who are waiting to hear back from employers, acceptance letters, etc. I have found a few things that have helped with the transition from being a college student to entering the real world. Even though I just graduated a little over a month ago there are very clear distinctions for post-grad life. Hopefully, the following tips help you feel productive, happy and ready to take on every day. Stay busy- This will be easy to do if you land a full-time job after graduation but the timing does not work out for everyone this way. If you’re on the job hunt try signing up for a workout class or volunteering at a non-profit a few days a week to keep your motivation up. It’s important to have a somewhat steady schedule so you don’t stop trying to find your purpose. Stay in touch with college friends- one of the hardest adjustments is one-month being minutes away from your closest friends & seeing them several times a week to moving away/ getting busy and maybe seeing them once a month. This may be easier to do if you live near your college town but the beauty of technology is that you can keep in touch with your besties who live over 500 miles away! Life gets crazy but it’s important to make time for the friendships that matter most. Keep learning – really Lauren? I just graduated from college and you want me to do homework? No, not like that! Just because your college classes ended doesn’t mean you should stop being curious about this vast world we live in. Whether it’s picking up a new hobby or reading books about topics you aren’t well versed in it’s important to keep pushing yourself to grow. I recently started reading The Psychopath Test by Jon Ronson and I’m learning more about psych wards, criminology, and the minds of criminals than I bargained for. This is a must read if you’re a psychology nerd like me who appreciates investigative journalism. Reminisce but don’t regret – Yes, we all long for our college days. Spending almost every day with our closest friends, facing new challenges every day, going to sporting events, and most importantly, getting free food all the time. Kidding…. Kind of. I would be lying if I said I don’t get a pang of sadness sometimes when I think about road trips visiting my best friends and boyfriend in college. However, it’s important to not dwell in that sadness because the best is yet to come! As college graduates, we can’t get so caught up in what we had that we miss what lies ahead. Rest- If your college career was anything like mine I would rarely get home before 8 pm. I get home around the same time from my full-time job but I am SO much more tired. Why is that…? I’ve learned it really does take a few weeks to adjust to working full time. I hope this list helps those of you who are also adjusting to this huge life change. Post- grad depression is real. It is a subject that isn’t talked about very much, but if you feel like you are experiencing this you’re not alone. While one in four students suffers depression during their university years, there are no official figures for the post-graduation period, according to The Guardian. Mike Burton, of the Sussex University Counselling service, says that this group “slips through the system”. On Instagram, we are living our best lives, but at the end of the day, we’re all just trying to figure it out. Here is a great article on the subject from The Washington Post. What has helped you adjust best after graduating from college? 2017 was a BIG year for me. It’s safe to say more than a few life milestones occurred this year. As the new year begins I can’t help but reflect on all of the changes that have happened in my life. Chase and I got engaged, I graduated from college, got to visit Europe twice, landed my first full-time job, and so much more. In June, my high school sweetheart proposed to me. You can read about Chase and I’s love story on The Knot. This summer I got to travel with Chase’s family throughout France and Italy. I plan on writing a separate blog post about this experience but to keep it simple it was nothing short of magical. It was everything I have ever wanted in a proposal and I am looking forward to the next step in our life together. I cannot believe I actually graduated from college! I earned a Bachelor’s degree in Journalism with a concentration in Public Relations and a minor in Psychology from the University of North Texas. My college journey hasn’t always been easy but I can already say it was all worth it. From starting out in community college, transferring to a four-year university I pushed through it all. From being a commuter student, working every semester, taking night classes, completing two internships, being involved in student organizations and graduating with honors. I am here to say that if you work really hard you can achieve your goals. Adjusting to life post-grad is probably going to be challenging but I am still too caught up in the whirlwind of the holidays and graduation for it to hit me yet. Anyone who knows me knows how important travel is to me. I am so blessed to have traveled to Europe TWICE this year. These are both trips that definitely have individual posts coming. Last week, I got back from a Rhine River Cruise with my aunt Diane. This was a graduation, birthday, and Christmas gift all rolled into one. Fortunately, we have been able to A LOT of amazing places over the years and I will write about our most recent trip soon. Hopefully, I will be able to continue to squeeze travels into my life even after college. Lastly, I started Life with Lauren. In 2017, during my last semester of college I learned that time flies by and if I don’t start chasing my dreams I may lose the time and motivation to pursue them. Even though I am still in the beginning stages I have already been pleasantly surprised by the responses I have gotten from my blog. Readers I barely know (or have never met at all) have contacted me letting me know that I inspired them by my community college story and other posts. After all, that’s what this space is about. Even though it’s just for fun (for now) my blog is a great way to express creativity and keep loved ones updated about my life. I have so much to look forward to in 2018 including; getting married to Chase, start working full-time for a company I love, and moving to Dallas. I am in such an exciting chapter of my life so I am trying to take it all in and make the most of every day. I am so thankful to live this life I’m living. Thank you to everyone who has benefitted my life and for reading this blog. Thanks for stopping by! What were some of the biggest lessons you learned in 2017? Before I started this semester, I made a list of goals (what else is new). At the very top of that list was locking down a job before graduation. I had several peers (and even mentors) tell me I was aiming too high or to not get my hopes up. Truth be known, December graduates have a tough time because we’re trying to apply for jobs right before the holiday season and the new year. Companies aren’t always looking to hire during this time. However, I persisted. I began applying for jobs in the beginning of October. I did research on Glassdoor religiously and sent more e-mails than I can count. I received plenty of rejection letters, held several phone interviews and visited a few offices for in-person interviews. There were times when I wondered if this was going to pay off or if I was going to continue searching after graduation like everyone else. To my surprise, an HR representative from Trunk club contacted me! There are several companies that contacted me but almost all of them were scams. Luckily, I remembered that one of my friends from North Texas Sweethearts works there. I will be working as an Associate Stylist at Trunk Club Dallas. I will be in contact with clients and in training for the first few months. I will be providing styling advice and manage relationships. Trunk Club is part of the Nordstrom family. Yay for Nordstrom discounts! You can learn all about Trunk Club here. Tuesday night, I became a North Texas Sweetheart alumna at closing ceremony. I am so thankful to have joined an organization that I cannot imagine my college career without. These are a group of women that I call my sisters at UNT. What is North Texas Sweethearts? You can read all about North Texas Sweethearts here. Sweaty palms, nervous laughter and an obnoxiously big smile are a few words to describe myself at North Texas Sweethearts recruitment two and a half years ago. In fact, I was so nervous I almost didn’t go to recruitment. I was a brand-new transfer student to the University of North Texas from Tarrant County College. Even though I had a few friends at UNT I did not know one person in North Texas Sweethearts. I am by no means an introvert but the idea of walking into a room with 60 plus females I don’t know struck fear. Fast forward four semesters and this is truly an organization I cannot picture my college experience without. Sweethearts is a circle of sisters where I have found some of my (not so future) bridesmaids, someone I can always grab coffee with and my closest friends. North Texas Sweethearts is an experience that I do not regret in the least bit. I am thankful to have found a sisterhood that makes UNT feel like home. As a senior, I am glad I got to give back to this organization in my last semester. Although I graduate this month I want to extend help to members who may need help around campus or just need a friend in Denton. I have enjoyed mentoring girls who want advice regarding anything from Public Relations (I love talking about my major) to blogging. I know that Sweethearts was extremely comforting to me when I barely knew any familiar faces upon transferring. Just a few of the reasons I am thankful for North Texas Sweethearts include: making countless memories, several close friends, unlimited photos and an entire sisterhood that I can count on. This experience serves as a testament to get out of your shell and try new experiences. Fear of rejection stops many of us from shooting for what we want whether its friendships, a career move or learning something new. It’s important to throw yourself out there no matter how vulnerable you feel because we often think of all of the things we can lose when really you have everything to gain! Even though I hold many responsibilities on and off campus I have continued to dedicate time for an organization that I call home, North Texas Sweethearts. If anyone has any questions about joining or would like to grab coffee, please reach out! Thank you for a platform to share my ideas. Thank you for a network of strong college women. Thank you for a chance to write for the #1 online magazine for college women. There is a lot to be thankful to Her Campus for as I reflect on four semesters of being involved in the organization. Basically, Her Campus is a great place to go if you want to find anything from the best study spots on campus to how to write a cover letter. Her Campus blogs are written in a conversational tone that should feel like you’re getting advice from one of your best girlfriends. I started reading Her Campus when I was a freshman in college and I found several articles that were helpful in my transition from a community college to a four-year university. Her Campus is aimed for the modern collegiette at every university. In my first few semesters, I would produce bi-weekly articles. This semester, we grew exponentially in size so only one post a month is required. There are opportunities to run social media accounts, event planning for events on campus and leadership positions. Writing isn’t the only position within Her Camus but that’s what I took advantage of because you can’t get this kind of platform anywhere else with such little experience. Being a part of organizations like this in college is a great way to dodge the dreaded phrase “sorry, but you don’t have enough experience” when applying for jobs post-grad. Personally, I’ve written about not graduating on time, why it’s okay to be jealous, and profile stories on fellow students to name a few. I would tell girls to write outside of their comfort zone. College is your chance to try new things and figure out what you love! I would definitely make a point to network with this group of college women. It is a diverse group of women but you all joined HC for a reason so you will have common ground. This could turn into friendships or business partnerships down the road. I definitely can attribute my love of Her Campus to push me to start a blog. Although my blog is still in the beginning stages I’m excited about where it’s going to take me! Her Campus is a great trial run for what it’s like to produce content on a deadline that readers are going to want to actually read. You never know until you try! I have grown to love my red hair, but it hasn’t always been this way. As a child, I begged my parents to let me dye my hair blonde or brown, basically any color but red. I would plead “please, all the kids are making fun of me and I just want to be normal.” Normal is such fallacy. The truth, is there is no such thing as normal. As a child, I was bullied mercilessly for having red hair. However, it comes to no shock that elementary school children are mean. Anyone who is different is called out. So much so, that in 2016 there was a fake story of a kid who sued his parents for giving him red hair *insert eye roll. Apparently, a believable enough scenario for people to think it was real. Hate crimes like “Kick a Ginger Day” inspired by South Park don’t help either. In middle school, bullying morphed into boys calling me “ginger” and teasing me about my freckles. They would make jokes about kicking a ginger or other distasteful terms. Growing up, I was told “you’re pretty for a redhead.” Can I never just be pretty? In high school, I was finally old enough to dye my hair so I tried everything from blonde to brown. It wasn’t until I started dating Chase that I started to love myself for who I was. He always disapproved when I wanted to color my hair. There is nothing wrong with coloring your hair, but I was doing it for all the wrong reasons. I was trying to become someone I wasn’t and it was anything but healthy. It has been years since I have been made fun of for my hair. Growing up, people always told me I would grow to love my red locks. I didn’t believe them until I reached college age and realized how unique I am. I also happened to meet two amazing redheads I regularly refer to as my sisters. I met Kyleigh and Eryn at recruitment for an organization called North Texas Sweethearts my junior year of college. At first glance, I was automatically deemed Eryn’s doppelgänger and we all connected from the start. There’s just something about a redhead bond, am I right? Ever since meeting my ging sisters I have refused to color my hair. Just by having red hair we connect on so many levels like shared trauma from bullying to foundation that will actually match our fair skin. We also regularly discuss different tanning lotions, but for the most part decide to ditch them altogether. I didn’t see how beautiful my hair was until I saw it through them and now you couldn’t pay me to change it. We love going out and tricking people into thinking we’re triplets. Two out of this trio have even successfully swapped ID’s *not recommended. Red hair comes with a lot of unsolicited questions like “Who did you get your red hair from?” and “OMG is that your natural color?”. But I don’t mind now. I am proud of what makes me different. Everyone used to make fun of my fiery locks but now, they’re one of the things that everybody says they love. I know my experience of being bullied pales in comparison to others. Instead, I want this story to serve as an opportunity to lift others up and stop critiquing each other for what we’re born with. If I have a daughter with red hair in the future, I would hope that she grows up in a world that tolerates people for all of their different characteristics. But if not, I’m sure that experience will turn her into a resilient young lady who hopefully shows empathy towards others for things they cannot change. What makes you different? Did you ever wish you could change it? 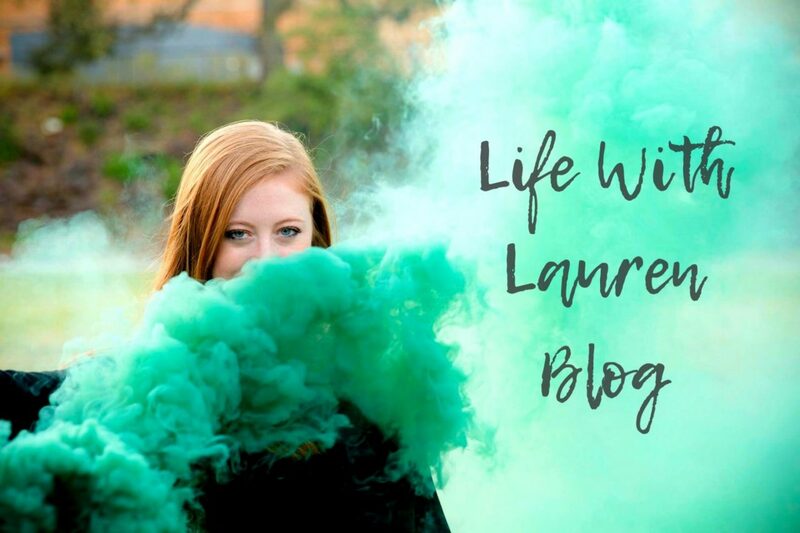 I have received SO many messages asking “how did you do that cool smoke thing in your photos?” that I decided to write a blog post about it! I had seen several bloggers and friends post surreal looking photos so I compared several different companies and reviews before trying it myself. I bought my smoke bomb from Shipped Yesterday. The specific product I used can be found here here for only $9.99. I chose to buy green for my school colors (go mean green) and for how much it would make my eyes pop in photos. They carry eight different colors, so choose as your heart desires. Just a warning, this is definitely a smoke bomb. The first few photos where I am nervously laughing, I was actually thinking “Oh gosh. Is this thing about to blow up on me? !” and just hoping for the best. The first five seconds it emits sparks so it’s important to point it AWAY from your body (and not at your photographer). Mine was a wire pull but for other companies you may need to bring a lighter with you. I would only use these smoke bombs in an open area you have a lot of space. We made sure not to do it on the concrete because we did not want to leave any stains. I stood in an empty grass field so we would not be near anyone. The color did not stain my clothes or skin but my hair definitely smelled like smoke afterwards. The product will emit a thick colored smoke so I wish that I would not have stood still. We got a great shot of the smoke covering me, but a few seconds later I was coughing like crazy (shown below). The smoke output lasts roughly 90 seconds, so you need to have your gear ready before you pull the wire. That may not sound like much time but you’re really going to get your best shots in the first 30 seconds and the rest will be extra. It’s imperative to have a professional photographer take the shots if you don’t want the fog to appear messy or cover your entire face. Because my photographer, Nick used high quality equipment you are able to see the detail of my face past the smoke. Overall, I am pleased with how my photos turned out! The green is not only my university’s color (go mean green) but helped my eyes pop in contrast. *This is not a paid post or advertisement. I tried to avoid making a boring list including things like “my favorite food is…” or “I love ____ movies…”. Instead, I hope this is an interesting list of things you did not previously know about me! 1. I am made up of almost all recessive traits. Yes, most of these you can see by just looking at me including: red hair, blue eyes, and freckles. I am also left-handed! I am a poster child for recessive genes. 2. I am a foodie thanks to Chase. My mantra for life is to always try new things (including food). I have tried everything from crickets to sea urchins. One of my favorite foods is sushi, especially sashimi like smoked salmon. Why make food boring when it’s something you have three times a day every day for your life! 3. I am Type A to the max. Yes, I can still cut loose and have fun. No, you will never have to move trash or items out of the passenger seat of my car to sit down. I live by my planner and the thought of losing it strikes fear. That’s where I write down everything I need to do and don’t know how some people get by without one. 4. I have a serious case of wanderlust. This is something most people know about me, but I love learning about the world even while I’m at home. I love Anthony Bourdain’s series Parts Unknown and watching YouTube travel vlogs from bloggers like Mimi Ikonn. Anyone who has been to my apartment has seen several maps plastered on my walls with pins of places I have been and lists of places that I want to go. This world we live in is too vast and full of too many interesting people to stay confined in a bubble. 5. I am the ultimate city girl. I claim Fort Worth because I was born here and my family moved back when I was in middle school but I actually grew up in a small town called San Angelo, Texas. Now, I can’t imagine living outside of a metroplex like DFW. Don’t get me wrong, I would enjoy camping or visiting a small town for a weekend but I thrive off of meeting new people. To each their own, but I love the energy a city carries and how there is always something to do. 6. I used to hate having red hair but now you couldn’t pay me to change it. The truth is, redhead kids get bullied a lot growing up just for being different! I plan on writing a blog post about this experience soon. 7. I am obsessed with Pinterest. I love all things creative including: crafting, photography and fashion. I could spend hours pinning ideas that I love and hopefully try one day. 8. I am super competitive, but not in the way that most people think. I’m not really into sports to be honest. I’m always competing against myself. I know that may sound silly to some people but if I don’t reach a goal I’m really hard on myself. The reason I get such good grades is because I know what I’m capable of. 9. I love coffee. I remember trying coffee in high school and almost spitting it out on the kitchen counter. Now, I can’t make it to my internship on time without it. I’ve gotten to the point where I can drink my coffee black but I prefer some cream and sugar. It also bothers me when people tell me it’s bad for you. I bite my tongue so I don’t scream “Well, that diet coke and cheeseburger you’re eating aren’t good for you either!”. Let people drink their coffee in peace, please. 10. I am ecstatic about starting this blog! For those of you who read my first blog post, you already know that I have wanted to start one for years. I am so glad I finally did and fully intend on making it the best I can. Thanks for reading! Anything you didn’t expect? What are some fun facts about you?